Use the PRO TREK's altimeter to help gauge the time you'll need to reach the summit! During measurement the watch displays an angle value, a direction indicator, and four direction pointers, which change dynamically when the watch is moved. Predict changing weather patterns using the PRO TREK's barometer. "Introducing the newest addition to the PROTREK lineup featuring an analog-digital display and Version 3 Triple Sensor technology. In addition to its fast & precise sensors for taking bearing, altitude, and barometric pressure readings, its also capable of alerting the wearer to significant changes in barometric pressure by an alarm and a unique indicator on the digital display. An auto hand shift feature momentarily moves hands away of the digital window when you check displayed readings, this makes them easier to read during certain time in the day when the hands would be covering the digital display. Other features include dual LED illumination of both the face and digital display, Smart Access, Tough Solar, radio-controlled timekeeping and more. Everything about this watch is designed and engineered to make it the ultimate in ease of operation and reliability. All this multi-functionality is packed into a slim profile 12.8 mm case. The PRW6000Y also has a carbon insert band for outstanding durability and long life. 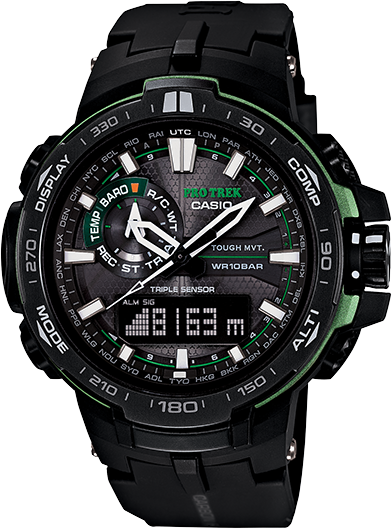 PRW6000Y-1 is analog-digital watch with black band with white/green accents on the face."